This week in Veg: How to cook a pound of arugula? | ReLocavore: Redefining "local"
This week in Veg: How to cook a pound of arugula? 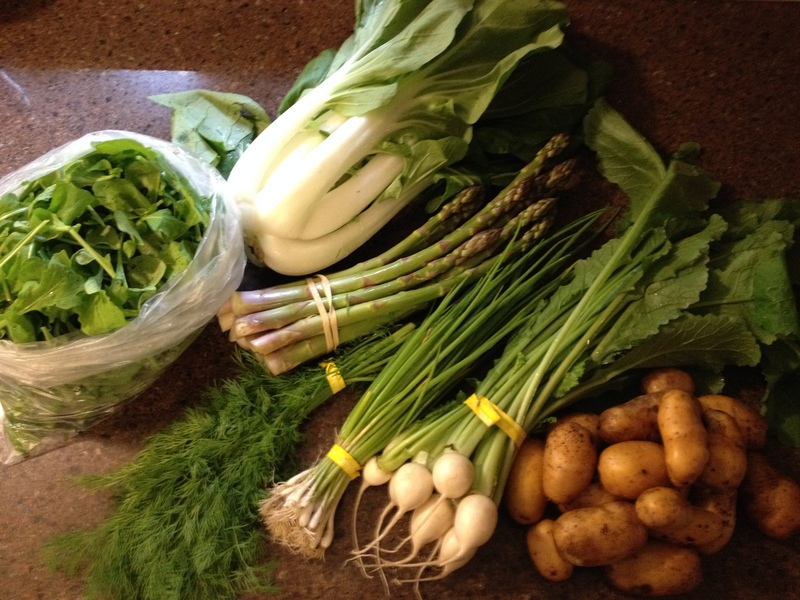 This week we got arugula, bok choi, asparagus, dill, green onions, hakurei turnips and new potatoes. Compared to last year, we hadn’t even started getting CSA deliveries. Anybody have suggestions on what I can make with a pound of arugula? Categories: Farms and Markets, This Week in Veg | Tags: arugula, bok choi, csa, green onions, local vegetables | Permalink. A pound of arugula? Roquette pesto is my go to with that much product. It’s a nice and spicy compliment for shellfish or rich risottos. It also freezes awesome. Thanks for the suggestion. We had arugula pesto with walnuts on angel hair pasta with pickled sweet peppers. Very tasty! Thank you.